This article is about the E. M Forster novel. For other uses, see Room with a View (disambiguation). Not to be confused with A Room of One's Own. 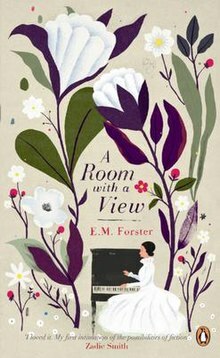 A Room with a View is a 1908 novel by English writer E. M. Forster, about a young woman in the restrained culture of Edwardian era England. Set in Italy and England, the story is both a romance and a humorous critique of English society at the beginning of the 20th century. Merchant Ivory produced an award-winning film adaptation in 1985. The Modern Library ranked A Room with a View 79th on its list of the 100 best English-language novels of the 20th century (1998). The first part of the novel is set in Florence, Italy, and describes a young English woman's first visit to Florence, at a time when upper middle class English women were starting to lead more independent, adventurous lives. Miss Lucy Honeychurch is touring Italy with her overly fussy and priggish but often ineffective older cousin and chaperone, Miss Charlotte Bartlett. The novel opens with their complaints about the pension where they are staying, the Pension Bertolini, at which rooms with a view of the River Arno had been promised, but which instead overlook a drab courtyard. One of the guests at the pension, Mr Emerson, interrupts their "peevish wrangling" by spontaneously offering to swap rooms. He and his son George both have rooms with pleasant views of the Arno, and argues, "Women like looking at a view; men don’t." Mr Emerson's offer causes Miss Bartlett some consternation partly because she looks down on the Emersons because of their unconventional behaviour, and partly because she fears that acceptance would place her and her young cousin under an "unseemly obligation". She decidedly rejects the offer. However, another guest at the pension, an Anglican clergyman named Mr Beebe, assures Miss Bartlett that the Emersons only meant to be kind, and persuades the two women to accept the offer. She then suggests that the Emersons are socialists. The following day, while Charlotte rests in the pension, Lucy decides to spend a "long morning" in the Basilica of Santa Croce, accompanied by another guest, Miss Eleanor Lavish, a novelist, who promises to lead her on an adventure. The older woman immediately takes away Lucy's Baedeker guidebook, which, she says, only touches the surface of things. She will show Lucy the "true Italy". But on the way to Santa Croce, chattering away, the two take a wrong turn and get lost. After drifting for hours through various streets and piazzas, they finally make it back to the square in front of the church only to have the novelist abandon Lucy (still having her Baedeker) in pursuit of an old man who, she says, is her "local colour box". Inside the church, Lucy meets the Emersons again. Although their manners are awkward and they have been treated rather coolly by many of the other guests of the pension, Lucy finds that she likes the Emersons, and repeatedly encounters them in Florence. One afternoon while touring Piazza della Signoria, Lucy and George Emerson separately witness a murder. George sees that Lucy is overcome, and catches her as she faints. When she recovers, she asks him to retrieve some photographs that she dropped near the murder site. George finds them, but out of confusion, throws them into the river because they were spotted with blood, and confesses why to Lucy; Lucy observes how boyish George is. As they stop to look over the River Arno before making their way back to the hotel, they have an intimate conversation. After this, Lucy decides to avoid George, partly because she is confused by her feelings, and partly to keep her cousin happy. Miss Bartlett is even more wary of the eccentric Emersons, since hearing a startling comment made by another clergyman, Mr Eager, who says that Mr Emerson, "murdered his wife in the sight of God". Later in the week, a party made up of Mr Beebe, Mr Eager, the Emersons, Miss Lavish, Miss Bartlett and Lucy make their way to Fiesole, located on a scenic height above Florence, in carriages driven by Italians. At first the driver is permitted to invite a pretty girl he claims is his sister onto the box of the carriage to accompany them. But later, when they sit closer and he kisses her, Mr Eager promptly requires that she leave them. In another carriage, Mr Emerson remarks how it is defeat rather than victory to part two people in love. Wandering about in the high fields after abandoning Miss Lavish and Miss Bartlett to their gossip, Lucy searches for Mr Beebe, and asks in awkward Italian for the driver to show her where everyone is. Misunderstanding, he leads her to a field where George is admiring the view. Overcome by Lucy's beauty amongst a field of violets, he takes her in his arms and kisses her. However, they are interrupted by a shocked and upset Charlotte, who is ruffled mostly because of her explicit failure at her duty as a chaperone. Lucy promises Miss Bartlett that she will not tell her mother of the "insult" George has paid her. The two women leave for Rome the next day before Lucy is able to say goodbye to George. In Rome, Lucy spends time with Cecil Vyse, whom she knew in England. Cecil proposes to Lucy twice in Italy; she rejects him both times. As Part Two begins, Lucy has returned to Surrey, England, to her family home, Windy Corner. Cecil proposes yet again at Windy Corner, and this time she accepts. Cecil is a sophisticated London aesthete who is desirable in terms of rank and class, even though he despises country society; he is also somewhat of a comic figure in the novel, as he gives himself airs and is quite pretentious. The vicar, Mr Beebe, announces that new tenants have leased a local villa; the new arrivals turn out to be the Emersons, who have been told of the available villa at a chance meeting with Cecil. Cecil brought them to the village as a comeuppance to the villa's landlord, whom Cecil (who believes himself to be very democratic) thinks to be a snob. Lucy is angry with Cecil, as she had tentatively arranged for the elderly Misses Alan, other guests from the Pension Bertolini, to take the villa. Fate takes an ironic turn as Mr. Beebe takes Mr. Lucy's brother, Freddy, to meet the Emersons. Freddy invites George for "a bathe" in a nearby pond. Freddy, George and Mr Beebe go to the pond, in the woods. Freddy and George take off their clothes and jump in, eventually convincing Mr. Beebe to join them. They enjoy themselves so much they end up splashing in and out of the pond, and running around it and through the bushes, until Lucy, her mother, and Cecil come upon them, having taken a short-cut through the woods. Freddy later invites George to play tennis at Windy Corner. Although Lucy is initially mortified at the thought of facing both George and Cecil (who is also visiting Windy Corner that Sunday), she resolves to be gracious. Cecil annoys everyone by pacing around and reading aloud from a light romance novel that contains a scene suspiciously reminiscent of when George kissed Lucy in Florence. George catches Lucy alone in the garden and kisses her again. Lucy realises that the novel is by Miss Lavish (the writer-acquaintance from Florence) and that Charlotte must thus have told her about the kiss. Furious with Charlotte for betraying her secret, Lucy forces her cousin to watch as she tells George to leave and never return. George argues with her, saying that Cecil only sees her as an "object for the shelf" and will never love her enough to grant her independence, while George loves her for who she is. Lucy is moved but remains firm. Later that evening, after Cecil again rudely declines to play tennis, Lucy sees Cecil for what he is and immediately breaks off her engagement. She decides to flee to Greece with acquaintances from her trip to Florence, but shortly before her departure she accidentally encounters Mr Emerson senior. He is not aware that Lucy has broken her engagement with Cecil, and Lucy cannot lie to the old man. Mr Emerson, with his open, honest talk, strips away her defences and forces Lucy to admit out loud that she has been in love with his son George all along. The novel ends in Florence, in melodramatic fashion, where George and Lucy have eloped without her mother's consent. However, Lucy has learned that Charlotte knew that Mr. Emerson was at Mr. Beebe's that fateful day, and did not discourage or keep her from going in and encountering him. Although Lucy "had alienated Windy Corner, perhaps for ever", the story ends with the promise of lifelong love for both her and George. In some editions, an appendix to the novel is given entitled "A View without a Room", written by Forster in 1958 as to what occurred between Lucy and George after the events of the novel. It is Forster's afterthought of the novel, and he quite clearly states that "I cannot think where George and Lucy live." They were quite comfortable up until the end of the First World War, with Charlotte Bartlett leaving them all her money in her will, but the war ruined their happiness according to Forster. George became a conscientious objector and lost his government job. He was given non-combatant duties to avoid prison. This left Mrs Honeychurch deeply upset with her son-in-law. Mr Emerson died during the war, shortly after having a confrontation with police over Lucy's playing the music of a German composer, Beethoven, on the piano. Eventually the couple had three children, two girls and a boy, and moved to Carshalton from Highgate to find a home. Despite their wanting to move into Windy Corner after the death of Mrs Honeychurch, Freddy sold the house to support his family as he was "an unsuccessful but prolific doctor". After the outbreak of the Second World War, George immediately enlisted as he saw the need to stop Hitler and the Nazi regime, but was not faithful to Lucy during his time at war. Lucy was left homeless after her flat in Watford was bombed and the same happened to her married daughter in Nuneaton. George rose to the rank of corporal but was taken prisoner by the Italians in Africa. Once the fascist government in Italy fell, George returned to Florence. Finding it "in a mess", he was unable to find the Pension Bertolini, stating "the View was still there" and that "the room must be there, too, but could not be found." Forster ends by stating that George and Lucy await the Third World War, but with no word on where they live, for even he does not know. He adds that Cecil served in "Information or whatever the withholding of information was then entitled" during the war, and was able to trick an Alexandria hostess into playing Beethoven's Moonlight Sonata by claiming he was Belgian, not German. Mr Beebe recalls his first encounter with Lucy was hearing her play the first of the two movements of Beethoven's final piano sonata, Opus 111, at a talent show in Tunbridge Wells. While visiting the Emersons Mr Beebe contemplates the numerous books strewn around. Toward the end of Part One, Cecil quotes a few unidentified stanzas ("Come down, O maid, from yonder mountain height", etc.). They are from Tennyson's narrative poem "The Princess". In the Emersons' home, the wardrobe has "Mistrust all enterprises that require new clothes" (a quote from Henry David Thoreau's Walden) painted upon it. In chapter five, after bemoaning the fact that people do not appreciate landscape paintings any more, Mr Eager misquotes William Wordsworth's poem title, "The World Is Too Much With Us", saying "The world is too much for us." Cecil announces his engagement to Lucy with the words: "I promessi sposi" ("the betrothed") – a reference either to the 1856 Ponchielli opera of that name or the Manzoni novel on which it is based. When George is lying on the grass in Part Two, Lucy asks him about the view, and he replies, "My father says the only perfect view is the sky over our heads", prompting Cecil to make a throwaway comment about the works of Dante. Late in the novel, Lucy sings a song from Sir Walter Scott's The Bride of Lammermoor, finishing with the lines 'Vacant heart, and hand, and eye,-/Easy live and quiet die'. Forster also incorporated Donizetti's operatic adaptation of Scott's novel, Lucia di Lammermoor, into the concert scene of his first published novel, Where Angels Fear to Tread. Like A Room with a View, The Bride of Lammermoor is centred on a talented but restrained young woman encouraged into an engagement not of her choosing. A Room with a View had a lengthy gestation. By late 1902 Forster was working on a novel set in Italy which he called the 'Lucy novel'. In 1903 and 1904 he pushed it aside to work on other projects. He was still revising it in 1908. The novel was first adapted for the theatre by Richard Cottrell with Lance Severling for the Prospect Theatre Company, and staged at the Albery Theatre on 27 November 1975 by directors Toby Robertson and Timothy West. Merchant-Ivory produced an award-winning film adaptation in 1985 directed by James Ivory and starring Maggie Smith as "Charlotte Bartlett", Helena Bonham Carter as "Lucy Honeychurch", Judi Dench as "Eleanor Lavish", Denholm Elliott as "Mr Emerson", Julian Sands as "George Emerson", Daniel Day-Lewis as "Cecil Vyse" and Simon Callow as "The Reverend Mr Beebe". BBC Radio 4 produced a four-part radio adaptation written by David Wade and directed by Glyn Dearman (released commercially as part of the BBC Radio Collection) in 1995 starring Sheila Hancock as "Charlotte Bartlett", Cathy Sara as "Lucy Honeychurch", John Moffat as "Mr Emerson", Gary Cady as "George Emerson" and Stephen Moore as "The Reverend Mr Beebe". The production was rebroadcast on BBC7 in June 2007, April 2008, June 2009 and March 2010 and on BBC Radio 4 Extra in August 2012 and March 2017. In 2006, Andrew Davies announced that he was to adapt A Room with a View for ITV. This was first shown on ITV1 on 4 November 2007. It starred father and son actors Timothy and Rafe Spall as Mr Emerson and George, together with Elaine Cassidy (Lucy Honeychurch), Sophie Thompson (Charlotte Bartlett), Laurence Fox (Cecil Vyse), Sinéad Cusack (Miss Lavish), Timothy West (Mr Eager) and Mark Williams (Reverend Beebe). This adaptation was broadcast in the US on many PBS stations on Sunday 13 April 2008. Noël Coward composed the 1928 hit song called "A Room with a View", whose title he acknowledged as coming from Forster's novel. The title of The Divine Comedy's 2005 album Victory for the Comic Muse is taken from a line in the book. The track "Death of a Supernaturalist" from their album Liberation opens with George Emerson's line, "My father says there is only one perfect view, and that's the view of the sky over our heads", followed by Cecil's, "I expect your father has been reading Dante". In the 2007 episode "Branch Wars" of the U.S. television show The Office, the Finer Things Club is seen reading and discussing the book over an English tea party. The film adaptation is discussed by the main characters if the 2011 British romantic drama Weekend. A scene from the film adaptation is viewed by the main characters of the U.S. television show Gilmore Girls. [episode needed] Rory tells Lorelai that she wants to show her home movies from her trip to Europe with her grandmother. A clip of Maggie Smith lamenting their lack of views is shown. ^ See the Dover Thrift Edition [New York, 1995], pp. 13–16. The "Room with a View" where the famous movie was acted.